A stunning French Manor House, both inside and out, with period features and furnishings contributing to its comfort and appearance. La Bourdette boasts a fabulous location with a stunning view of the Pyrénées in the distance and provides a wonderful setting for relaxation and recreation, with superb leisure facilities in the extensive grounds and throughout the surrounding countryside. Please note there is a reduction of 40% for the 2 week period between Saturday 29th June and Saturday 13th July for a group limited to 12 in number. "We were lucky enough to be asked to stay at La Bourdette this summer, and it comfortably surpassed our already high expectations. As veterans of many a family holiday in assorted chateaux, villas and 'gites' over the past two decades, La Bourdette has shot straight to the top of our 'favourites' list, and we can't wait to return. Over the last 10 years or more, this property has been lovingly restored to its former glory - and then some! It now sleeps up to 16, and so is perfect for holidaying with other families and friends. In terms of facilities, La Bourdette has virtually everything you could possibly want to keep everyone occupied from small child to adult. The stunning swimming pool is served by a pool house cleverly converted from an old outbuilding with a games room on the ground floor, a bedroom and a chill-out area upstairs, and a balcony overlooking the pool which is ideal for candlelit dinners. Elsewhere in the extensive grounds is a tennis court, and a 'boules' pitch – the latter a perfect meeting place for drinks at sunset! La Bourdette is less than an hour's drive from Toulouse airport, and is set in idyllic French countryside. The nearby village has a great 'boulangerie' for croissants and bread, and we tried out several lovely little bars and restaurants in the area during our stay. There is so much to explore in the vicinity, and excellent shopping in St Girons. We could go on and on, but suffice to say that La Bourdette is an absolute gem." "Just to say that we think "La Bourdette" and its grounds and facilities plus the whole surrounding area are absolutely wonderful. We are having such a lovely time, and we wish we could stay longer. Please tell Ros Lovell (the owner) that her home and grounds are beautiful, and all totally to our taste. I reiterate that the caretakers are fantastic. We had the best possible holiday with our large family at La Bourdette this August. The house was magic. It is filled with a lifetime of wonderful memories popping out of every newly discovered corner. There was so much to do that it was hard to know where to start or stop: tennis, bike riding, ping pong, mass family football, badminton, boules, and of course swimming in their beautiful clear large pool. It really is a very special place indeed. David and Cathy, the caretakers, were utterly cheerful and helpful; nothing was ever too much trouble. Thank you. We hope to be able to come again soon. Pam & Tim Williams, Somerset, England. Passing through the gate and along the tree-lined drive, it was love at first sight; immediately, we all felt we were entering someone's much-loved home and not a standard rental villa. We were a party of adults and children wanting activity combined with a little peace and I can honestly say that everyone was more than satisfied! The house is charming: a big well-appointed kitchen, full of personal items, a large shady terrace - one of several outdoor dining areas, an elegant drawing room, gorgeous bedrooms tastefully decorated, plenty of well-appointed bathrooms, and the whole house exuding homeliness, style and comfort. Outside, a fabulous pool surrounded by beautiful flowers, an extremely well-appointed pool house with table tennis and football, and with upstairs, a sitting room for those wanting to escape the sun. A large balcony overlooking the pool provided another venue for eating outside. Throughout the charming and spectacularly planted grounds there were many peaceful little corners, having a pre-supper drink by the boules court was another huge pleasure, with a superb tennis court, surrounded by beautiful trees only a short walk from the house. It is a testament to how much we loved the place that we were never really tempted to go on outings. The local villages and surrounding markets supplied all our needs and we were happy to enjoy everything that this spectacularly special place has to offer. A truly memorable holiday which exceeded all our expectations - we cannot recommend La Bourdette highly enough! The Denny family. Yorkshire, England. From a quiet country road within sight of The Pyrenees, electronically-operated gates open into a sweeping drive, lined with plane trees, which leads to this magnificent south-facing Manor House. La Bourdette has been completely restored, furnished and equipped to the very highest standards, with designer flair, elegance and sophistication throughout. There is wifi access throughout the ground floor and in most of the bedrooms in the main house. Entrance Hall – spacious and welcoming, with a limestone flagged floor with a fireplace, period chairs, large windows overlooking the drive and an elegant spiral staircase to the first floor. Sitting Room – a large, striking and stylish room with attractive 'Osborne and Little' wall covering, polished wooden floor, large comfortable sofas and a period stone fireplace. There is a wide-screen satellite TV with a DVD player. French windows on 2 sides open onto terraces. Kitchen – very light and spacious with beamed ceiling, tiled floor, island unit and a chef’s range cooker, comprising a gas and electric oven, 7 gas rings and hot plate. Other equipment includes a drinks fridge, microwave, 2 dishwashers, massive toaster, Magimix, liquidiser, cafetières etc. plus a Bose CD player and radio with iPod input and lots of CDs. A door opens onto a flagged seating area and vine-shaded dining terrace with a table seating 16. Dining Area – large yet cosy, with a beamed ceiling, a table for 12, a second table for 4 and a large fireplace. In one corner is a desk with a printer and scanner. French windows open onto the gravelled area at the front of the house. Utility Room - with a large fridge/freezer/ice-maker, 2 washing machines, separate tumble dryer, ironing board and iron. Please note the two children's bedrooms detailed below contain beds that are suitable for children and teenagers. Bedroom 1 - with a stylish 6' 8" four-poster bed, windows looking south and an en-suite (Bathroom 1) with a shower, washbasin, W.C. and bidet. Bedroom 2 - with a 6’ 3" wrought iron double bed, a full length 3’-wide wrought-iron single bed and windows looking south. Bedroom 3 - a children's room with four 3’-wide single beds, two of which are full-length, and an en-suite (Bathroom 2) with a bath, a walk-in shower, washbasin and W.C. Bedroom 4 - with a 6’ wrought-iron four-poster bed. Bathroom 3 – opposite bedroom 4 and very large, featuring a free-standing bath with overhead shower, a washbasin, bidet and W.C. Bedroom 5 - with lofty ceilings, an exposed stone wall, French windows, a 6' 6" double bed and a wrought-iron child's bed (3' x 6'). Bathroom 4 - with a bath, walk-in shower, wasbasin and W.C. Bedroom 6 - a second children’s room with 2 full-length single beds and 2 full-length bunk beds. A fabulous 2-storey Pool House provides a large games room, comfortable sitting room and a charming double bedroom. Games room – occupying the whole of the ground floor and featuring table tennis, table football and a kitchenette containing a large fridge/freezer/ice-maker. A wall of French windows open onto a dining terrace, 8 metres (25 ft) from the edge of the pool. Shower room – accessed from the ground floor terrace and featuring a shower, a washbasin and W.C. Sitting room – on the First Floor, and accessed by a spiral staircase from the games room and tucked under the eaves, featuring comfortable sofas, an armchair and bean-bags, wide-screen TV and DVD player (with lots of DVDs), and a CD player. There's access to the large, open-air dining terrace overlooking the pool, plus steps descending from this terrace to the pool area. Bedroom 7 – tucked under the eaves with a 6' 3" double bed and windows overlooking the pool. 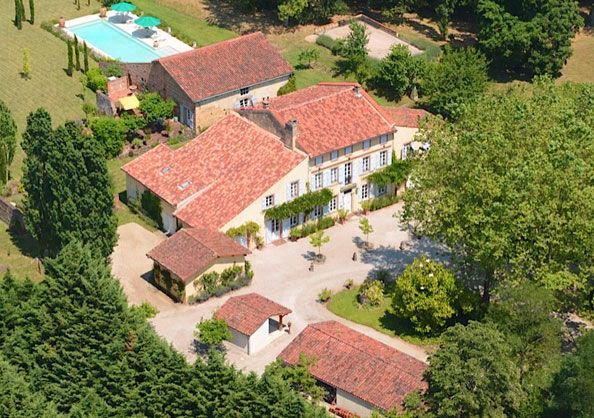 La Bourdette is set in 20 hectares (50 acres) of totally private, rolling, wooded farmland, with distant views of the Pyrénées. The House is surrounded by an extensive colourful garden of lawns, flower beds, mature trees and shrubs. Through Balinese doors from the kitchen and dining area, there is a charming dining terrace shaded by vines and another dining terrace on the first floor of the Pool House. In the middle of the garden, a shady terrace also has tables and a barbecue area with a brick surround containing two gas barbecues. 100 metres from the House is the state-of-the art tennis court with a practice wall at one end. There is also a badminton net plus racquets and shuttlecocks and a specially laid out ‘bouledrome’ (boules pitch) with 4 pairs of boules. The L-shaped, heated swimming pool measures 18 metres (58 ft) in length, 7.5 metres (24 ft) at the base of the "L", and 5 metres (16 ft) at its upper end. Very wide steps descend to the shallow end (1 metre, or 39 ins), sloping to a deeper area in the middle (2 metres, or 6' 6"). There is a wide, safety shelf at a depth of 60cms (2 ft) running along 2 sides of the pool. The pool is filtered and slightly saline, (roughly the strength of human tears) which avoids the use of chlorine and helps keep the water crystal-clear. The pool is alarmed. Around the pool there are 12 sun beds, tables, chairs and several large sun umbrellas. A charge of £200 per week will be deducted from tenant's Booking and Security Deposits if pool heating is required. La Bourdette enjoys a peaceful rural location in the stunning South West region of France, against a backdrop of the Pyrénées. There are basic shopping facilities at Daumazan-sur-Arize (2 kms), including an excellent 'boulangerie', butcher and a small supermarket whilst at Montesquieu-Volvestre (7 kms) there is a wider variety of shops including several good boulangeries and a larger and well stocked supermarket. The market towns of Carbonne and St Girons are 22 and 40 kms respectively. La Bourdette is 65 kms (usually less than one hour) from Toulouse's Blagnac international airport, whilst Carcassonne airport (which has some international flights) is 100 kms. The nearest entry to the autoroute (the A64/E80) is 20 kms, whilst the super-fast train, the TGV, stops at Toulouse. Tenants will be met on arrival, and will be shown how everything works, both inside and out. There is WiFi/Broadband internet access in the Main House. 3 hours of cleaning per day on 2 days per week are paid for by the owners, as well as swimming pool and garden maintenance. Any additional hours of housework should be agreed direct with the cleaner/s, and paid to her/them by tenants at €15 per hour. David and Cathy White are the caretakers and welcome guests on arrival. They have a house with its own separate entrance. Provided sufficient notice is given, a part-time cook and/or a babysitter can be found. Payment in cash for each meal will be the tenants' responsibility and the charges per meal will be advised prior to confirmation and should be settled on the day. There is a travel cot and a high chair. There are ceiling fans in all bedrooms except bedroom 6 (one of the two children's room) which is air conditioned. This is an all-the-year-round property and is centrally-heated throughout. There is a very helpful information folder with details of recommended local shops, restaurants, markets, cultural, sporting and recreational activities plus many other suggestions on what to do and where to go in the vicinity. The folder also includes maps, brochures and contact details of local doctors, dentists, plumbers, electricians, pool maintenance etc. This is excellent bicycling country, reasonably flat, and with a dedicated trail from the House to the next door village of La Bastide de Besplas and into the surrounding countryside. Bicycles can be hired through David White, the caretaker. There are fine walks in many directions. Marked pedestrian and mountain-biking trails lead to the upper heights of the Pyrénées where chamois, genets and even lynxes and brown bears are to be found. There are a number of pretty villages in the surrounding area. An outstanding example is Carla-Bayle, standing on the top of a hill, with fine views of the Pyrénées, and boasting several interesting art galleries and shops. Near Carla-Bayle is a very popular children's "treetops" adventure centre. There are prehistoric caves at Tarascon, and ancient cave drawings at Niaux. The fascinating caves of the Grotte du Mas d'Azil (10 kms) are "drive-through" but can also be visited on foot. The 18-hole Golf de l'Ariège is near the pretty village of La Bastide-de-Sérou (20 kms). Trout streams abound in the Pyrénées, dropping down to rivers much favoured by kayakers and canoeists. The Lac de Mondèly (20 kms) offers good, fresh-water swimming, and has a basic café on its shore. There are several restaurants within 10 minutes' drive. The nearest local vineyard encourages tastings and on-the-spot purchases. Visits should be arranged in advance – details are in the information folder. There is ski-ing in the Pyrénées (90 minutes' drive) in most years from January to March and a recommended resort is Luchon. Outings to Toulouse (45 minutes) are highly recommended to enjoy the many fine art galleries, museums, restaurants and excellent shopping. Its Old Town with its rose-pink façades (therefore known as the 'Ville Rose') is particularly attractive. Visits to the Aerospatiale Centre and to the Airbus factory, both near Toulouse, are much recommended. Unless otherwise agreed, all rentals will be for a minimum of one week, and will begin and end on a Saturday. Tenants should arrive as soon as possible after 5pm on the commencement day, and should leave by 10am on the agreed day of departure. They will be met on arrival at La Bourdette. A Booking and Security Deposit of £750 will also be payable to Anglo French Properties Ltd on signing this Rental Agreement. This will secure the booking and will cover (a) the cost of replacing/making good any losses, breakages and/or damages incurred during the rental, (b) the cost of pool heating (if required) @ £200 per week, and (c) any exceptional cleaning work which may be required at the end of the tenancy. It will be refunded (less any deductions as outlined above) within 4 weeks of the conclusion of the tenancy. Unless otherwise agreed, there should not be more than 16 people staying in the property at any one time. The owners' insurance policy requires that all doors are locked, and that all windows as well as the shutters at the rear of the Pool House are closed when tenants are away from the property. The electronically operated entrance gates will close automatically after cars have driven away from the end of the drive. Three sets of remote controls to open these entrance gates will be provided upon arrival. Please note these controls are both expensive and difficult to replace if damaged or mislaid. Near the tennis court and 80 metres from the house is a partly walled pond where young children should be supervised when nearby. Please close and tie all sun umbrellas at night and on windy days as they are easily blown over and are expensive to mend/replace. Tenants are required to take out their own insurance for the duration of their stay at La Bourdette.